The Vein Center – Cardiovascular Associates, P.C. The Vein Center is a division of Cardiovascular Associates that specializes in vein disease. The physicians and clinical staff are dedicated and trained to provide the best, most up-to-date care for the patient with vein disease. 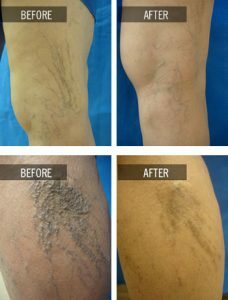 Within the last few years, the use of laser has become an accepted alternative to surgical vein stripping. Endovenous laser therapy requires a minimal incision with insertion of a thin laser fiber into the diseased vein. The healthcare provider delivers laser energy through the fiber, which then causes the vein to close or sclerose as the fiber is gradually pulled back. This procedure is done in an outpatient setting with return to normal activity, especially walking, immediately following the procedure. With completion of the procedure, your blood will now flow through healthy veins back to your heart. With the underlying disease process fixed, sometimes there is a need to perform stab phlebectomy. This procedure for larger protruding veins requires only local anesthesia and tiny incisions leaving minimal, if any, scarring. Most often, phlebectomy is performed at the time of the endovenous laser ablation. Patients are very satisfied with the immediate resolution of the varicosities. Sclerotherapy continues to be the standard treatment for spider veins. A special solution, Sotratetradecol, the only FDA approved sclerosing agent, is injected into the veins causing them to close, shrink, and disappear. This is performed in the office and does not require any anesthesia. The heart pumps the blood down to the leg arteries. However, the veins depend on the leg muscles to push the blood back up to the heart. When you walk, the calf and thigh muscles squeeze the veins, pumping the blood up to the heart. Inside the veins there are valves that act as check-valves or one-way doors that only allow flow toward the heart. When you stop moving, gravity would pull the blood back down to the feet; however, the valves close preventing backward flow. 200,000 Americans die each year when clots in the veins (Deep Venous Thrombosis, DVT) break loose and travel to the lungs (pulmonary embolism, PE). Many of these deaths are preventable. A simple medical questionnaire can help determine a person’s risk for developing one of these clots and allow effective prevention. Sometimes the valves inside the veins don’t function normally. They fail to completely close, allowing the blood to reflux, or move downwards. 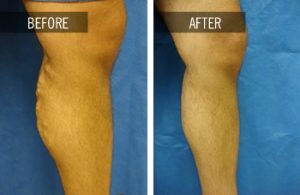 We say, in this instance, that there is venous insufficiency or that the valves are leaking or insufficient, increasing the pressure inside the veins of the legs. With the increased pressure, the veins balloon out or dilate. RISK FACTORS for vein disease include heredity, pregnancy, obesity, standing a long time, and possibly trauma. The valves of veins are thin and elastic, and they can stretch due to the conditions listed above. SPIDER VEINS are the small, thread-like, red-colored veins on the surface of the skin. Many people seek treatment for spider veins for cosmetic reasons, but they also may cause discomfort or bleeding. VARICOSE VEINS are described as engorged “rope-like” veins that are visible under the skin. Varicose comes from the Greek word for grape-like. They generally grow in size over time and can cause tingling, itching, substantial pain, fatigue, swelling, and even ulcers. They are caused by venous reflux, blood flowing the wrong direction through leaky valves in the legs. Varicose veins affect 15-25% of all adults, including men. LEG ULCERS result from prolonged venous insufficiency. 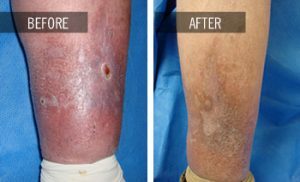 Over time, the increased venous pressure on the legs will result in skin color changes and ultimately leg ulcers or wounds that fail to heal. Once the development of leg ulcers occurs, the healing process could take months due to swelling. Extensive wound care therapy could be needed. At The Vein Center we will review your medical history, examine your legs, and perform a venous ultrasound before recommending a treatment plan. A review of your medical history will help identify factors that increase your risk for vein disease as well as determine any obstacles to treatment. The physical exam is important to see if the symptoms you are having are related to the vein disease that we can see. The duplex ultrasound will give us the detailed information about the function of the valves so that we can plan a treatment that will alleviate the problems you are experiencing. ULTRASONOGRAPHY is a painless, noninvasive test that uses sound waves to examine the veins and to determine if the valves are working normally. After surgery, the test is repeated to ensure successful closure of the vein and to make sure there are no clots in the deep veins. No special preparation is necessary for the test. You may eat and go about your regular activities. You will be asked to undress from the waist down and shorts will be provided. To improve the quality of the ultrasound, a colorless gel is applied to the area where the transducer probe will be placed. The gel may feel cool and a bit moist, but will be wiped off at the end of the test. During the exam, there may be some minor discomfort from the probe pushing on your legs. The test will take about thirty minutes. Our vascular lab has been accredited by the Intersocietal Commission for the Accreditation of Vascular Laboratories, sponsored by over ten professional societies, including the American College of Cardiology. The accredited symbol attached to our reports indicates that our testing procedures have undergone rigorous review and were found to be accurate and consistent. Our goal is to improve your symptoms and the physical appearance of your legs. Treatment will not “cure” the disease. Remember that your legs will look worse before they look better. It takes time for inflammation, bruising, and swelling to subside so that you can see the result. EVLA is used to treat veins with leaking valves. A thin laser fiber is inserted into the diseased vein through a small needle puncture in the leg. 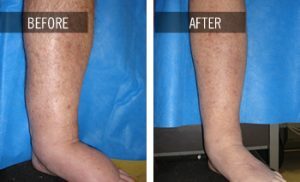 Previously, treatment of varicose veins required a surgical procedure called vein stripping. With EVLA, no extensive surgery is required. The patient is awake and the leg is anesthetized. The physician delivers energy into the vein as the laser fiber is gradually removed from the leg. This closes the diseased vein so that blood no longer leaks through the valves. The entire procedure is performed in less than one hour in our office, and the patient is encouraged to walk immediately after the procedure. Ambulatory phlebectomy is accomplished by making small incisions over the enlarged veins and then using a special hook to remove the varicosed vein. The incisions are made using a needle or a small puncturing instrument. No sutures are needed. This procedure is often performed in conjunction with EVLA. Again, the patient is encouraged to walk immediately after the procedure. Sclerotherapy is the main treatment for spider (small red-colored) or reticular (blue-colored) veins visible just under the surface of the skin. Sometimes this technique is also used to treat varicose veins. A small needle is used to inject a sclerosing liquid into the diseased vein. The solution acts on the lining of the vein to cause it to seal shut. You may feel a slight stinging as the fluid is injected. Most patients need three to five treatments to completely close the veins. You should shave, but do not apply lotion on your legs immediately before treatment. Avoid exposure to sunlight during the course of your vein treatment. If sun exposure is necessary, we recommend SPF 30. Compression stockings assist the leg in the pumping of blood back to the heart. Stockings may help the symptoms of venous disease, but it will not make varicose veins go away. All patients are required to wear compressions stockings after EVLA treatment for two weeks to obtain the best results from the procedure. Frequently, insurance carriers require a trial of compression stockings before they approve endovenous laser ablation (EVLA). The stockings are machine washable, dryer safe, and usually last for four to six months. Patients should always bring their stockings with them to each office appointment.